Portland Sea-lavender is an extremely rare plant in the UK and is now protected under Schedule 8 of the Wildlife and Countryside Act. The cliffs of the Isle of Portland in Dorset are internationally important for their geological interest and they are also home to a rich limestone flora. The occurence in Britain of Portland Sea-lavender is entirely restricted to these cliffs, where is it still easy to find. 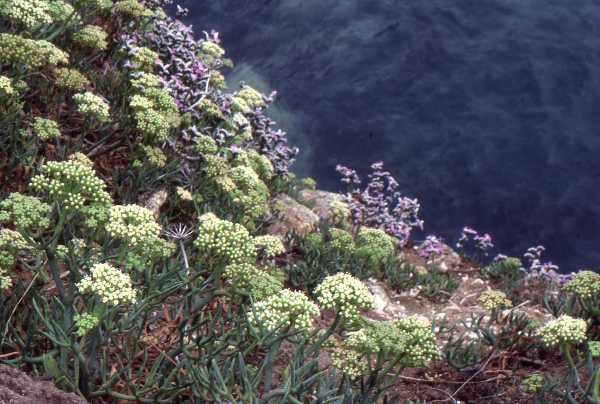 Portland Sea-lavender has pinkish-lilac flowers which resemble those of Rock Sea-lavender, but they differ in that they are borne in a dense, curved spray. This plant blooms from July to August.